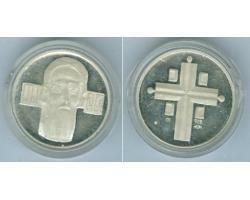 Silver, fineness 925, small round shape, Ø 25 mm, 5 g.
Avers: The head of the saint in an anasas, longitudinally, combined with the inscription left and right so it looks like a cross. Inscription with ancient cyrillic STX SAVA. Revers: Baptism with 4 glasses, in the field of three trademarks, two for silver and one mint - ZIN.